Hidden away behind other buildings is one of the gems of Edinburgh's Old Town, the Kirk of the Greyfriars: also known as the Greyfriars Tolbooth and Highland Kirk, or just simply Greyfriars Kirk. Churches are usually amongst the easiest of buildings to find, announcing their presence with a tower or steeple. Not so Greyfriars Kirk, and as a result finding it takes a little detective work. Your starting point should be the circular stone tower of the beautiful Museum of Scotland building. Looking across the road to its west you see a pub, Greyfriars Bobby's Bar. To the left of the pub as you look at it is a passageway. It leads into Greyfriars Kirkyard. 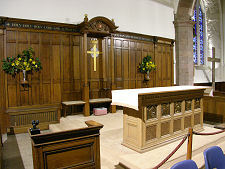 The Kirk itself is a beautifully restored yellowish harled barn of a building, sitting amid a surprisingly large space to have been so successfully hidden away in the heart of the Old Town. 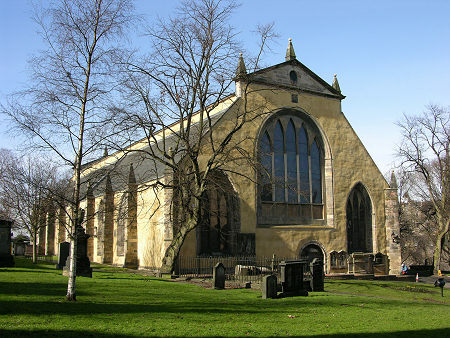 Greyfriars was the first church to be built in Edinburgh after the Reformation of 1560, and was built on land granted by Mary Queen of Scots, previously the property of the Franciscan convent in the Grassmarket (hence the name Greyfriars). 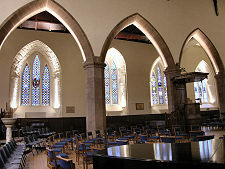 Building started in 1602, using stone reclaimed from a disused Dominican convent elsewhere in the city, and the kirk opened for business on Christmas Day, 1620. Greyfriars has an important place in Scottish history. In 1638 the National Covenant was signed here, sparking a series of conflicts that were to last for nearly half a century including the misnamed English Civil War and the "killing time" of the latter half of the 1600s (see our Historical Timeline). 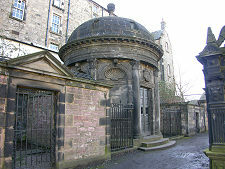 In 1679 the Wars of the Covenant returned to Greyfriars, when the South Yard of the kirkyard was used as a temporary prison for 1200 Covenanters awaiting trial. This must have been a remarkably grim prison, open to the skies and shared with the mausoleums that line both sides of the yard, but it is hard to see how it could have been an especially secure one. Elsewhere in the kirkyard is the Martyrs Monument, erected in 1709 in memory of the Covenanters killed in the 1600s. 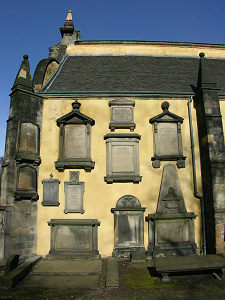 The rest of the kirkyard contains one of the best collections anywhere of monuments going back to the 1600s. But it is a more recent grave that is one of the most visited in the kirkyard. This is the grave of John Gray, who was an Edinburgh policeman who died of tuberculosis on 15 February 1858 and was buried here. According to popular legend he had a dog, a Skye Terrier called Bobby, and for the following 14 years, until the dog's own death in 1872, Bobby kept watch over John Gray's grave. The true story of Greyfriars Bobby may be more complicated than that. It now seems most likely that he was a stray who made a home for himself in the kirkyard, and had applied to him the (at the time surprisingly common) myth that he was there out of loyalty to a dead owner. Whatever the truth, Greyfriars Bobby has gone down in history as an emblem of devotion and faithfulness. Hence the name of the pub next to the kirkyard entrance. And hence the statue of a dog in front of the pub. 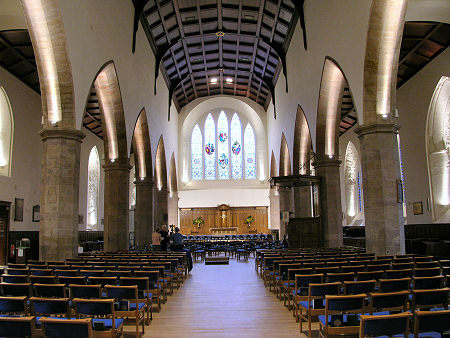 The interior of Greyfriars Kirk is beautiful and spacious. The church has had an accident prone history, and as a result much of what you see inside is younger than you might expect. For example Greyfriars originally had a tower at its west end. However, the town council used it as a gunpowder store, and in 1718 the inevitable happened. When the west end of the church was rebuilt, the tower was omitted, though space was provided for two separate congregations. 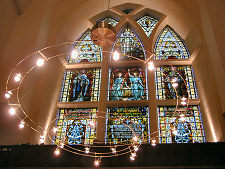 In 1845 fire destroyed much of the older part of the church and badly damaged the newer part. 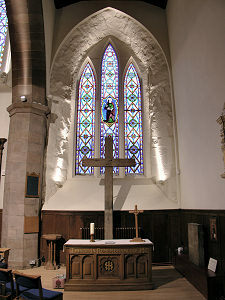 The rebuilding took until 1857 to complete, and included the first addition of stained glass windows to any Scottish parish church since the Reformation nearly three hundred years earlier. Robert Louis Stevenson's 1897 observations on Greyfriars in Edinburgh: Picturesque Notes can be read here. 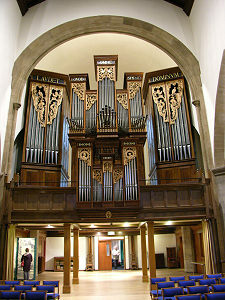 It was only with a major restoration between 1931 and 1938 that the two halves of Greyfriars Kirk were reunited under a magnificent new ceiling of Californian redwood.